Russell Crowe has apparently taken notes from the Christian Bale in Vice School of Transforming into a Big, Fat, Iconic, American Behind-the-Scenes Villain. His ghoulish mogul of choice? Roger Ailes, disgraced CEO of Fox News. 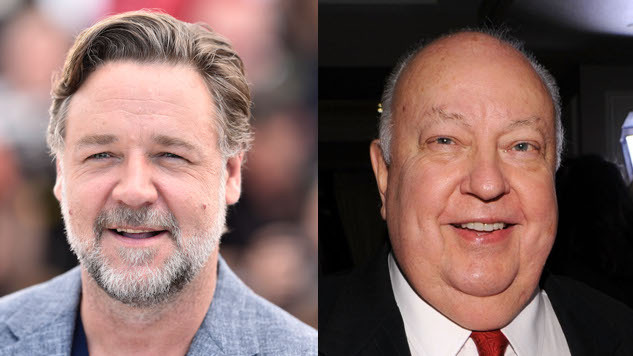 Crowe will appear as Ailes in Showtime limited series The Loudest Voice, which has assembled an impressive team. The series is based on the book of the same name by Vanity Fair writer Gabriel Sherman, who will also pen episodes alongside Spotlight Academy Award winner Tom McCarthy. Horror/thriller extraordinaire Jason Blum will produce the eight-episode run. Other stars appearing include Naomi Watts, Sienna Miller and—in a rare dramatic role—Seth McFarlane. The show will chronicle Ailes’ rise from local television news producer to one of the most important voices in the Republican Party—strategizing for Nixon, Reagan, the Bushes and Trump—and executive of the news network that reshaped American political discourse with open sensationalism, fear-mongering and paranoia. Ailes’ life, filled with assorted anti-semitism and bigotry, ended in a fervor of sexual assault allegations in 2017. After several prominent anchors accused him of sexual harassment and assault with the #MeToo movement on the horizons, Ailes was given $40 million to depart from Fox. He died shortly thereafter at his home in Florida, at which point his life story became a hot property. As a result, Showtime’s The Loudest Voice isn’t the only Ailes biopic in development. John Lithgow is set to star as the media monster in Fair and Balanced for Lionsgate, an ensemble piece that will focus more on Ailes’ record of predation among Fox employees, with various anchors played by the likes of Charlize Theron, Nicole Kidman and Margot Robbie. See Crowe as Ailes below.